The mind is like a car battery — it recharges by running. One of the coolest moments in my racing history happened a few weekends ago. On a cold and drizzly Seattle morning, in the early Sunday fog, we were off through downtown prepared for a hilly, challenging Hot Chocolate 15k. I expected many things from this race. I knew I would be wet, cold, and wobbly- legged from the hills. What I didn’t except was the eerie, elated feeling of turning up a steep hill to see the course turn dark and serpentine into the Battery Street tunnel. Sheltered from the rain for almost a mile, the light at the end of this particular tunnel was bittersweet. Inside, we were dry. 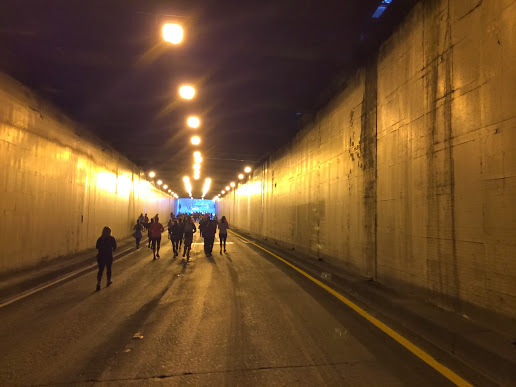 Thousands of running footsteps echoed off the walls, cheery voices welcoming the shelter from the rain, lanes completely empty except for us – runners. Hundreds of us, making our own traffic noises, all blending together as we curved along to see the opening back into the daylight. I can’t say enough good things about this race. I tried in my post for RunOregon. My crowd-averse self normally registers events like this as a bit of a chore, but RAM Series‘ Hot Chocolate single-handedly revived my interest in, and enjoyment of races. I’ll take hill tired all day, every day when the trade-off is stoked on racing again.